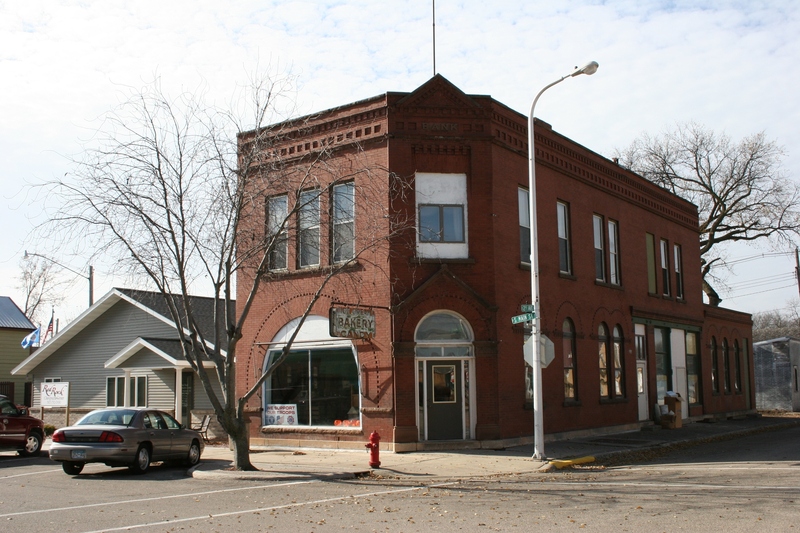 This 1892 former bank building and 95-year bakery anchoring a corner of Lamberton’s Main Street is being renovated into Seven Sisters Coffee by a young couple with connections to this area of southwestern Minnesota. After the business opens, the upstairs will be renovated into loft style apartments. DAVID AND MICHELLE can see beyond the crumbling mortar, the moisture damage, the buckling floor boards, the teal paint. Just barely into major renovation of an historic 1892 bank building and former long-time bakery in downtown Lamberton, this couple is thoughtfully and methodically working toward their summer 2013 goal of opening Seven Sisters Coffee. This shows the side and back view of the building, with the rear part added on to the original. Soot from a 2005 fire, which destroyed Plum Creek Crafts next door, mars the brick. Behind the building, a tree was removed and plans are to install a patio area for outdoor dining. They saved a slice of the tree to build a table. Even the name, Seven Sisters, holds special significance for the pair as Michelle is one of seven sisters and three brothers who grew up in Lamberton, a strong agricultural community of 822 in Redwood County on the southwestern Minnesota prairie. Additionally, Michelle notes that Seven Sisters possesses multiple meanings—in Greek mythology, astronomy and even as a mountain range. The old sign for the former Sanger’s Bakery still graces the building. The couple may, perhaps, feel at times as if they are scaling a mountain to reach their goal of establishing a combination cafe, coffee shop and entertainment venue in the 1,900 square foot first floor of the 8,000 square foot brick building. But they are purposeful and focused and driven every week to travel 2 ½ hours from their home to proceed with their project on the prairie. 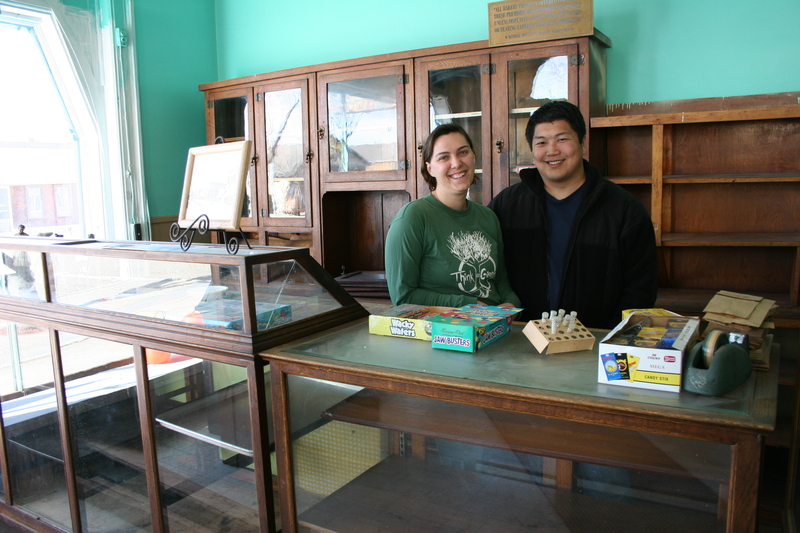 Michelle and David are keeping the original candy and bakery goods counters and the vintage cabinet, photographed here in the front part of the building. This area of the former bank and bakery will house the cafe and soda fountain. The couple discovered a dumb waiter hidden in the area behind them in the corner. David envisions Seven Sisters as “an artistic haven as well as a community space.” He expects “townies,” he says, to frequent the front Main Street side of the building, the bright and cheery cafe section offering a full breakfast and lunch menu and ice cream treats from a soda fountain. 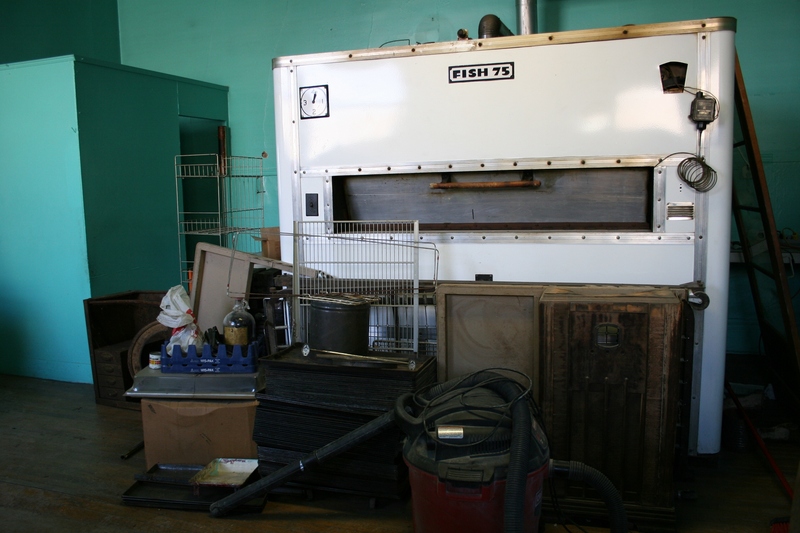 Fifty loaves of bread could be baked in this 1960s vintage two-ton rotary oven. It occupies much of the space in the middle room which will become a cozy coffee shop. 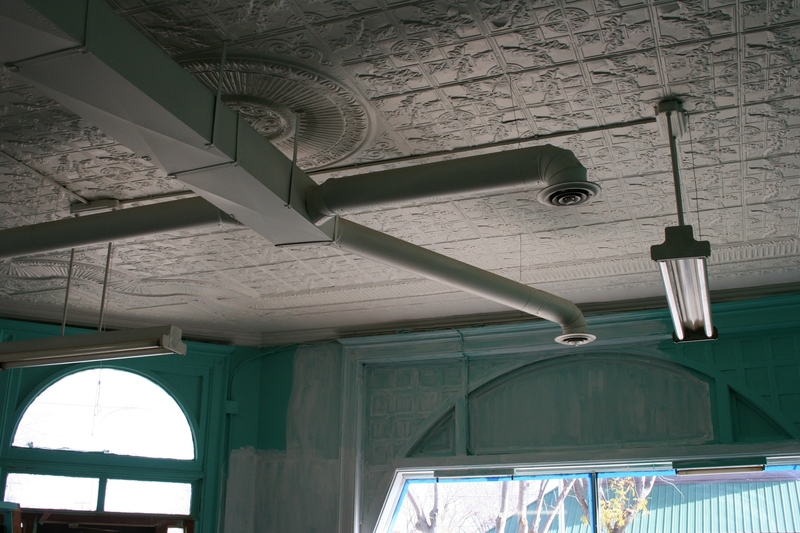 This room and the front former bakery/soda fountain area were painted teal after Bob’s niece first chose that hue for the bathroom. Bob loved the color so much that he painted the rest of the place teal. The color has been on the walls for 50 years. No, they are not keeping the teal color. 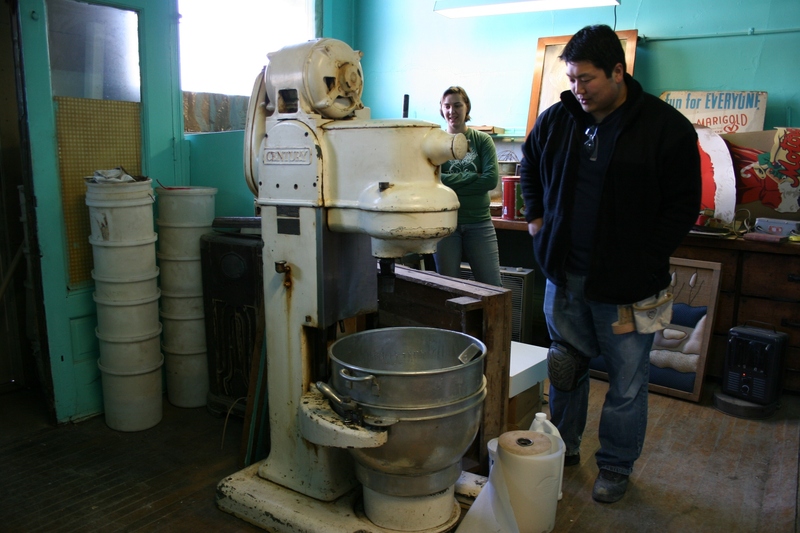 An oversized mixer also occupies space in the middle room. The smaller middle section, once a post office entry, baking area and even home to the Sanger family, will be transformed into a warm and intimate coffee shop. 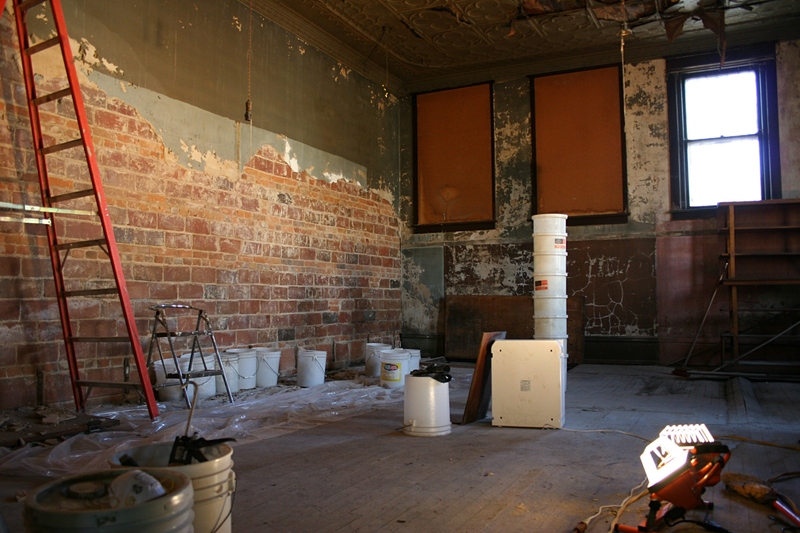 The back room, with focal point brick walls, will become an entertainment venue and artists’ haven. And in the rear area of exposed brick walls, David expects artists and others to hang out in a more energetic and modern New York loft style space devoted to music and art and private event rental. Tour this building, inside and out, with David and Michelle and you can see the overwhelming amount of work, inside and out, that needs to be done before Seven Sisters becomes a reality in a community already embracing the business venture. Locals as well as those living in neighboring towns such as Revere, Jeffers and Tracy and even farther away in the regional hub city of Marshall are ecstatic about Seven Sisters, David says. 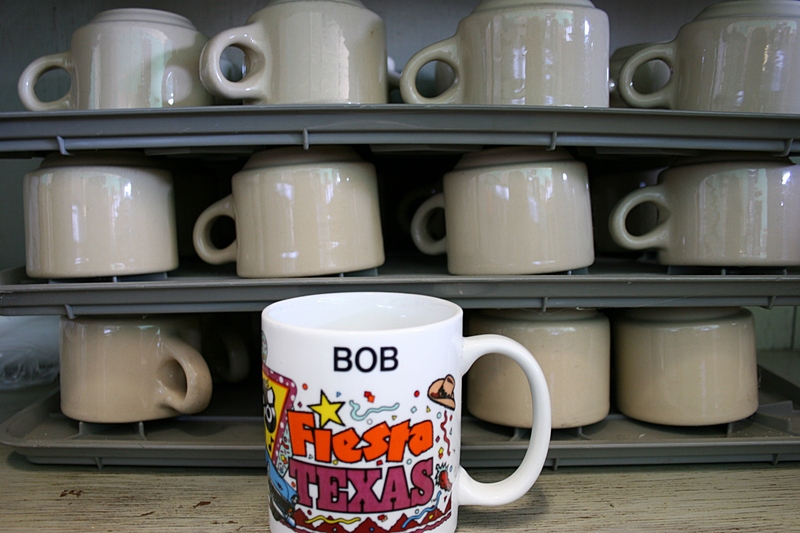 Original coffee cups and Bob Sanger’s special cup are stacked under the lunch counter. 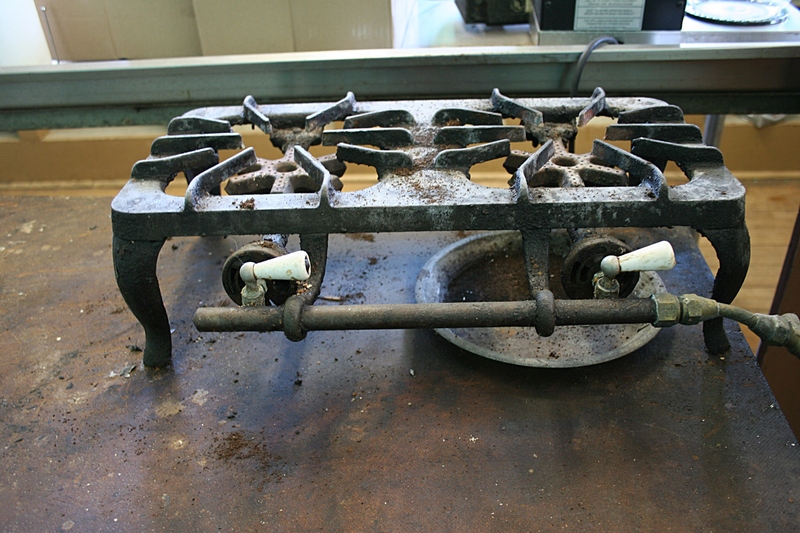 The older gas burners Bob Sanger apparently used to make coffee, etc. When locals George and Vern, for example, stop by to check on the renovation, David invites them inside for coffee. The two were coffee klatsch buddies of Bob Sanger, long-time bakery owner who died in March. 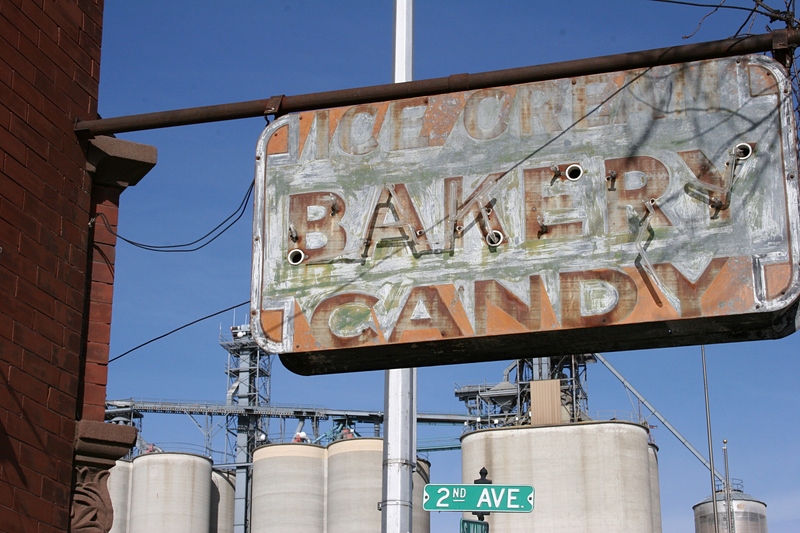 Sanger purchased the bakery from his father, Nick, in 1961. Between Bob, Nick and previous owner, Martin Kuhar, the building has housed a bakery in the First National Bank building for 95 years. 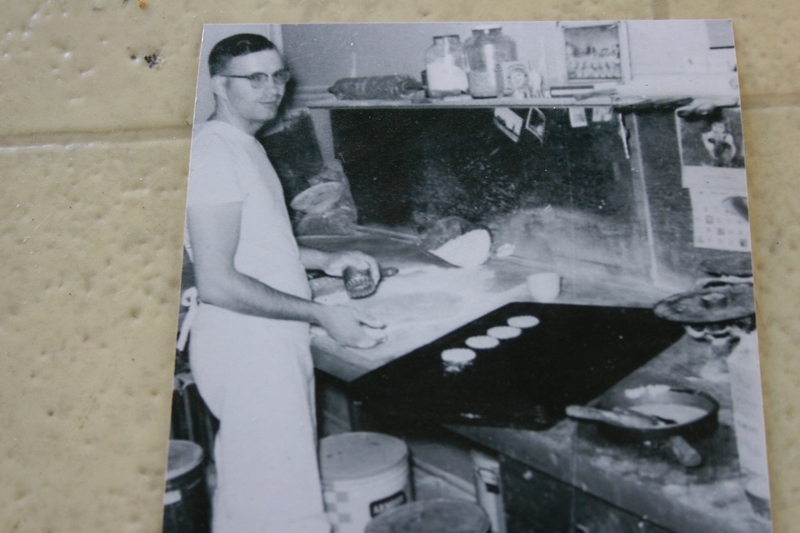 A vintage photo of bakery owner Bob Sanger who died in March at the age of 80. 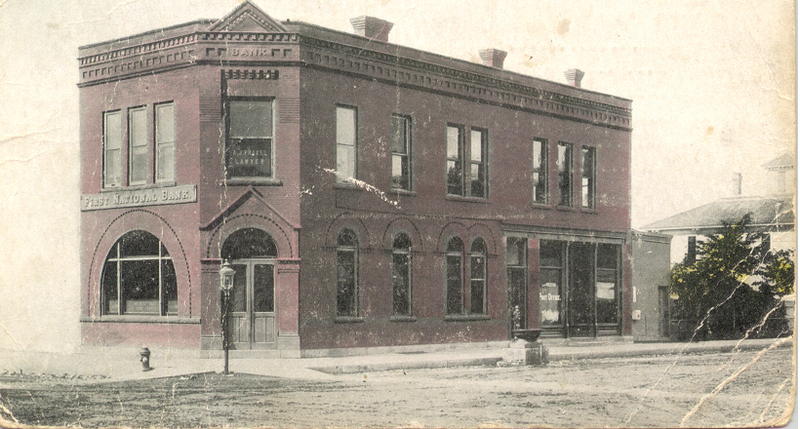 A vintage photo of the First National Bank. The building is positively gorgeous and has a fascinating history. We had admired it for some time. The quality of the construction is superior to similar buildings of that era. We’ve always talked about opening our own business and the location and timing were right. Our review of the local economy and the needs of the surrounding area indicates a very strong potential for growth and a serious need for a business of this kind. By offering excellence in service in three different approaches (cafe, coffee shop, event space) we will offset some of the inherent risk of this type of business. In short, it was a perfect confluence of events. We got lucky. The pair is determined also to buy local as much as possible. Dry goods will come from Griffith’s Grocery across the street. They plan to work with Brau Brothers Brewing and Fieldstone Vineyards, located in the region. They’ll grow their own herbs. It is clear in talking to David and Michelle that they appreciate the historic gem they’ve purchased. A section of this original lunch counter built by Bob Sanger will be refurbished and topped with granite. They’re attempting, they say, to retain as much of the natural charm as possible. For example, they plan to refurbish the soda fountain built by Bob; relocate an original bank fireplace facade and tile into the coffee shop and install an electric fireplace; refinish the wood floors; keep the tin ceiling; reuse the candy and bakery counters; restore an old player piano; and more. 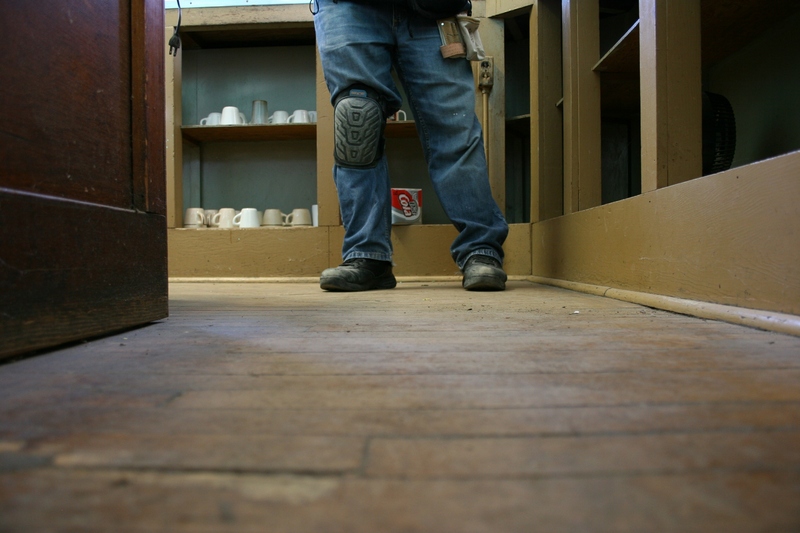 Wooden floors, like this behind the lunch counter, run throughout the building. In one section, however, where the bank vault once stood, the floor is made of pipestone granite. This shows a section of the original tin ceiling in the front part of the building. Ceilings are a lofty 12 and one-half feet high. Plans are to move the facade and tile from the this original First National Bank fireplace into the coffee shop, which David will manage. The couple is also uncovering and sifting through collectible treasures like WW I and WW II artifacts, signage, rocks, and more accumulated by Bob. So much was damaged though, beyond saving, by moisture problems in the building, David says. But they are saving what they can, possibly incorporating some of their treasures into Seven Sisters. A pile of recently found treasures. 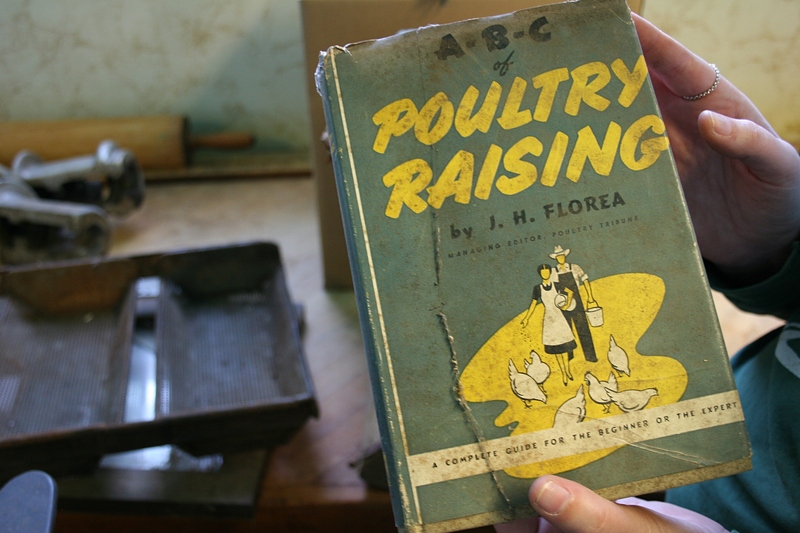 Among the old books uncovered was this one on poultry. Bob Sanger kept a flock of 100 chickens at his house, Michelle says. He used the eggs at his bakery and also sold eggs. 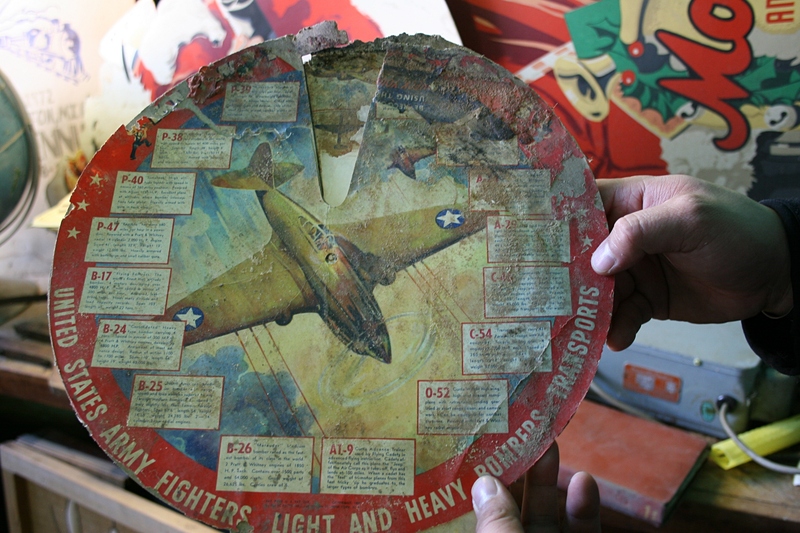 Another find, a vintage bomber transport chart damaged by water, like many of the old items found in the building. 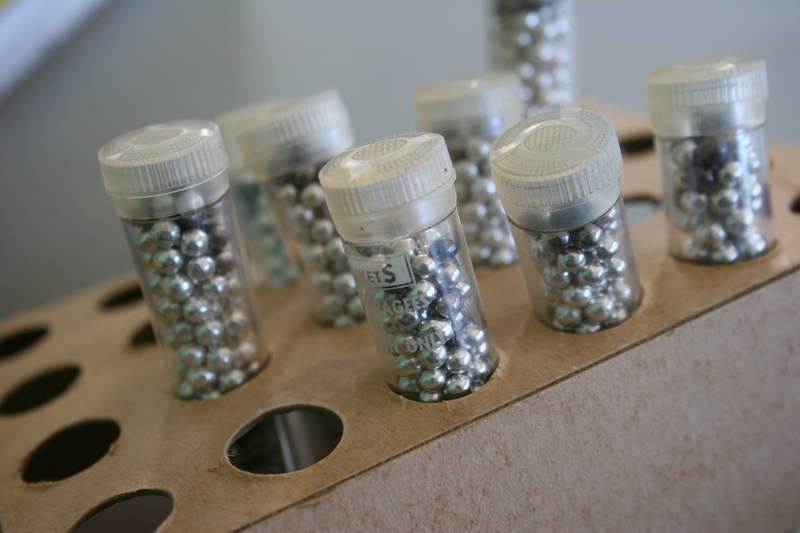 Inedible silver cake decorating balls remain from Bob’s days of baking wedding cakes. 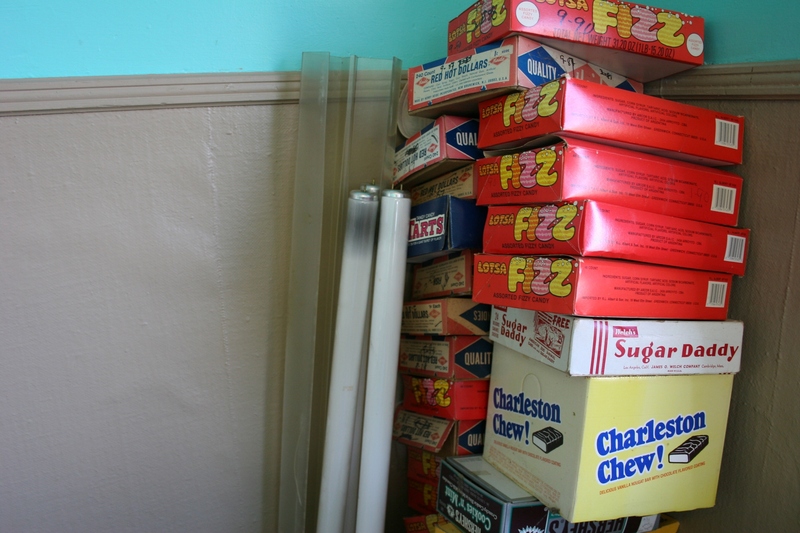 The couple found empty candy boxes (pictured here) and candy still in boxes inside the former bakery. Thinking about the hundreds of people who have memories of this building, I really hope we can fill that same role for the next generations. FYI: Lamberton is located along U.S. Highway 14 about 10 miles east of Walnut Grove, childhood home of Laura Ingalls Wilder, author of the Little House children’s book series. The area is a strong draw for summer tourists interested in Wilder’s books and the Little House on the Prairie television series set in Walnut Grove. And this is only a sampling of the treasures as I was told Bob Sanger was somewhat of a pack rat. The Sanger family also took from the building what was important to them. 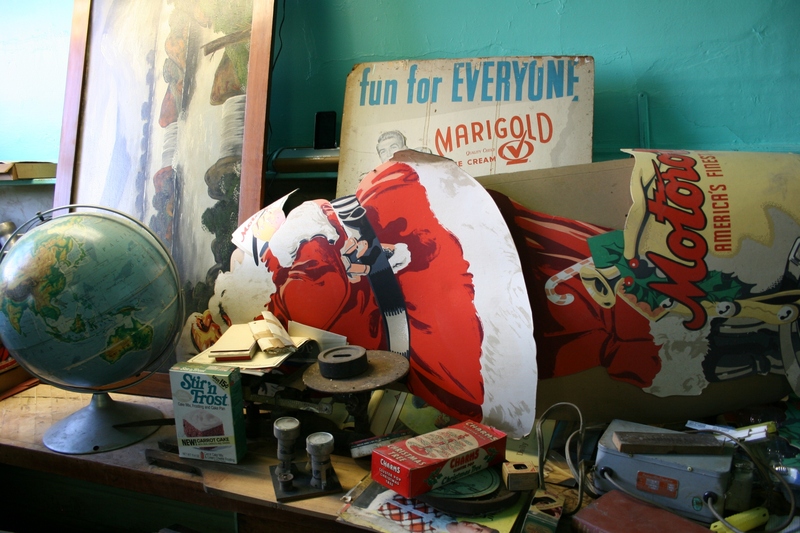 And the Van Engens have a lot more treasures in storage awaiting appraisal and decisions on what they may reuse in the building. When I walked in, I almost instantly asked about the vintage 7-UP clock I’d seen on the wall the last time I peered inside a window of the locked and vacant building. Not sure where it ended up, but I think with the family. I cannot wait to see Seven Sisters when it’s open. But I hope to visit at least once more before next summer to check on progress. The Van Engens are the exact right individuals to open a coffee shop/cafe/entertainment venue here as they appreciate this treasure of a place. I was incredibly impressed with them and their plans. Absolutely, I know you would be there, C, given your deep appreciation for small town businesses. I totally agree with your perspective on projects like this breathing life back into small towns. The Van Engens possess so much enthusiasm. It was just fun to see that and learn of their plans. They also have the support of organizations like the Redwood Area Development Corporation, working with businesses in this part of rural Minnesota. I’m adding this coffee shop to my list of destinations! Thanks for also including where it’s located and some other area attractions in the area. You are most welcome, Erin. For sure you can spend a day in Walnut Grove if you’re a fan of Laura Ingalls Wilder. Walnut Grove puts on an outdoor pageant several weekends in July based on stories from the Little House books. There’s a wonderful museum and gift shops in town and you can visit the Ingalls’ dug-out site. Closer to Sanborn, you can even stay overnight in a sodhouse. Lamberton also has a wonderful, wonderful antique store. 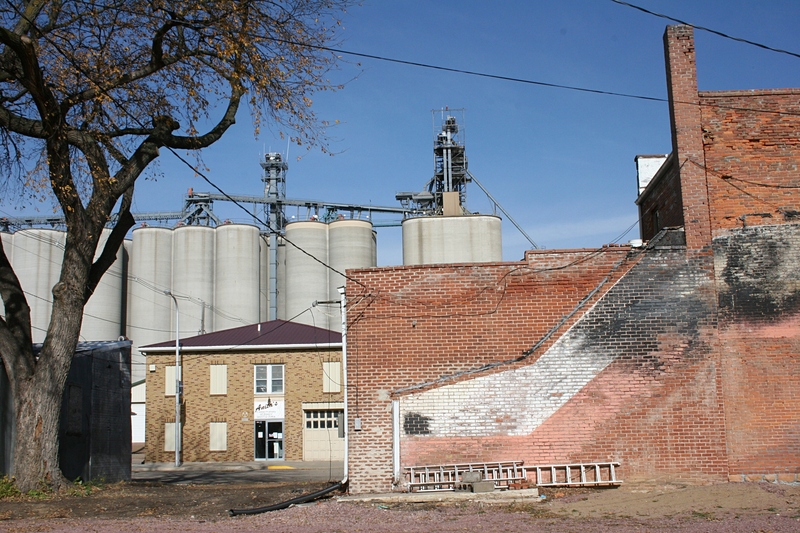 If you love small towns, this area along U.S. Highway 14 in southwestern Minnesota is a great place to visit. Plan ahead for overnight accommodations, though, as hotel space is limited in the immediate area. There’s a great county park, Plum Creek County Park, just outside of Walnut with camping. But it fills quickly. Good luck to them! It looks like a big job, but what a wonderful place they will have when it is finished. So glad to hear they are keeping as much of the original furnishings as possible. I don’t blame them, however, for eliminating the teal! Yes, that teal is a bit too much. I asked what color they intend to paint the cafe and coffee shop, but the Van Engens haven’t decided yet. I told them they should keep an unpainted patch of teal somewhere to honor Bob. I agree that this couple has a lot of work to do. But they are doing much of the work themselves and with the help of family and friends and tapping into the pros as needed. If anyone can succeed, they will. The Van Engens are determined. If you met them, you’d be quite impressed. I love when old buildings are put to good use again – they have such personality. A lot of work to fix up, but so cool. Great shots. Absolutely agree. I hate when wonderful old buildings are torn down in the name of progress. From what I hear, Worthington has been terrible about that. I’m so glad we have a few cool old ones. The Dayton House is certainly a great example of cool and old. Supposedly it’s haunted…haven’t experienced that in my time there! We have stayed at the older motel on Hwy 14 and have searched for a spot to eat…found none. This is on our route returning from the Sturgis Rally in August. I will have to re-read this post just to take in all the details of your visit!!! Awesome post!!!!!!!!!! Thank you, Doreen. I know there’s a lot of content in this post, but I didn’t want to leave anything out of my story. I photographed the Lamberton Motel and plan on posting a few pix from Lamberton soon. The local American Legion serves food, but I don’t know the hours. You absolutely need to check out Seven Sisters when it opens. Did you get down to the Highland Cafe this morning? Great review of Seven Sisters Coffee. I boughts lots of candy from those cases. I wonder if I bought Red Hot Dollars from that old box?! I can’t wait to visit Seven Sisters often when back to Lamberton visiting my folks. Both Seven Sisters Coffee and the Lamberton Antique Peddler have Facebook pages, too. And the American Legion is open for lunch and dinner I think every day except Sunday. Good food, but no coffee or ice cream! Sara, thanks for all the detailed info on places to stay, etc., in Lamberton and the area. I wasn’t aware the sodhouse was no longer a B & B and I forgot Kuhar Park. So I appreciate this additional info. I have not forgotten about meeting your dad, Stan the Clown. He’s on my story list still. You’re welcome! And thanks. Did you happen to be there this past Saturday – if yes, did you make it to the huge rummage sale? Oh, yes, we were there on Saturday and I wanted so bad to take in the rummage sales and pumpkin painting. But I was committed to making (mostly photographing) horseradish making. Yes, it has quite the history. Thank you for the wonderful post about our adventure. You captured some great photos of the work-in-progress. Hopefully you can visit again in a few months and it will be a totally different appearance. We really appreciate seeing all the positive comments from your readers as well, and knowing so many people are supportive of our venture. You are most welcome, Michelle. I loved sharing your business adventure with Minnesota Prairie Roots readers. You and David have a well thought out plan and the enthusiasm and energy to make Seven Sisters a success. Thanks for the invitation to check on progress when I’m back in my home area. I love that they are restoring this beautiful piece of history….if only I was younger!!!! I think that all the time when I see empty store fronts! Thank you, Stacey, for embracing this project like all of my other commenters today. I know the support here and in the Redwood County area means a great deal to the Van Engens. Youth most assuredly does have an edge on us Baby Boomers, doesn’t it? Sounds like you grew up in a lovely home. I have every intention of keeping updated on the progress of Seven Sisters and will most certainly give you, my readers, a look inside when all is done for sure, and maybe once in between. Thanks for the link. Readers, if you have not checked out the Seven Sisters Coffee website, please do so. Do you know if they tried to, or are registering the building with National Historic Registry?? 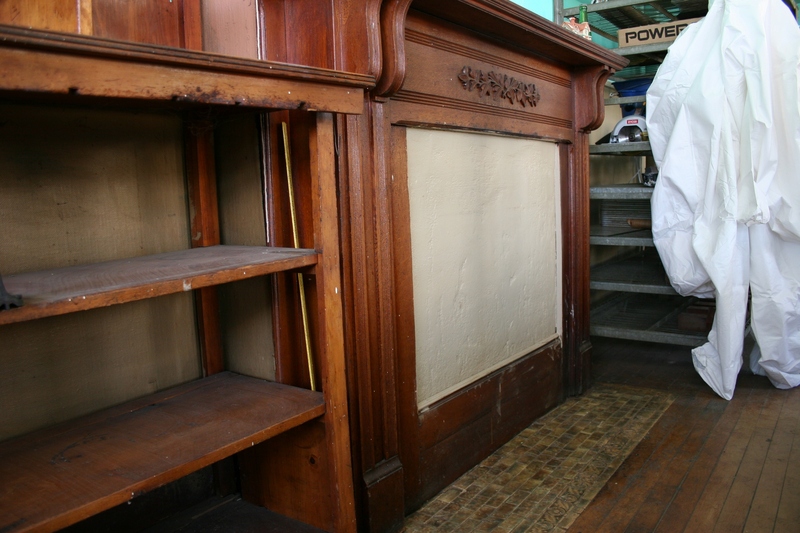 We are in the process of purchasing an old bank very similar to this one, and condition. I just know that the tax incentive program helps make a project like this possible. I just checked the real estate website and see that the old bank building has been sold. Where are you buying an old bank and what are your plans?